Karuta is a traditional Japanese card game, which is played mostly during the New Year holidays when families and friends get together. 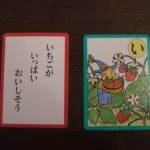 There are two kinds of cards in karuta – yomifuda (reading cards) and torifuda (grabbing cards). Torifuda has a corresponding drawing to yomifuda and the first kana is written at one corner of each torifuda card. Torifuda cards are spread on a table or on a floor. Then the game starts. One person is in charge of reading yomifuda, and other players have to find and grab the associated torifuda before anybody else does. The person who gets the most cards wins the game. Let me introduce ぐりとぐらかるた(Guri and Gura karuta), which my family and I played this January. 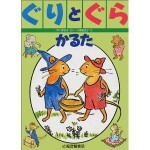 Guri and Gura series by Rieko Nakagawa(words) and Yuriko Yamawaki(drawings) has been popular worldwide since its debut in 1963. My elder son is 4 years old, who cannot read kana yet. Still, he could enjoy playing Guri and Gura karuta, full of pretty drawings. 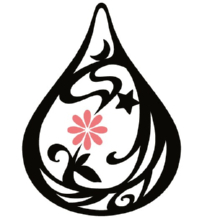 Torifuda has the drawing of many starawberris with the first kana “i” at the corner of the card. Japanese popular comic duo Ujikoji are from Tochigi. Ujikoji published this karuta in 2009, and tried to make Tochigi known to the world in funny ways. When you buy this karuta, yomifuda CD in Ujikoji’s Tochigi dialect is attached to it.